This is a revised and new recipe – I made it one Sunday afternoon, needed to get into the kitchen after a long stroll chilled out walk by the sea..Breathing the fresh air I was full of beams and all I wanted to do was to unwind even more and no better way to do but by trying out this new recipe. This Gluten free Cinnamon Apple Cake is very easy can be served as dessert or a breakfast cake. A buttery soft textured cake that can be baked with few ingredients and tastes so good. Adding apples and cinnamon with caramel makes this cake into a real delight. I had to share this simple tasty recipe with you. 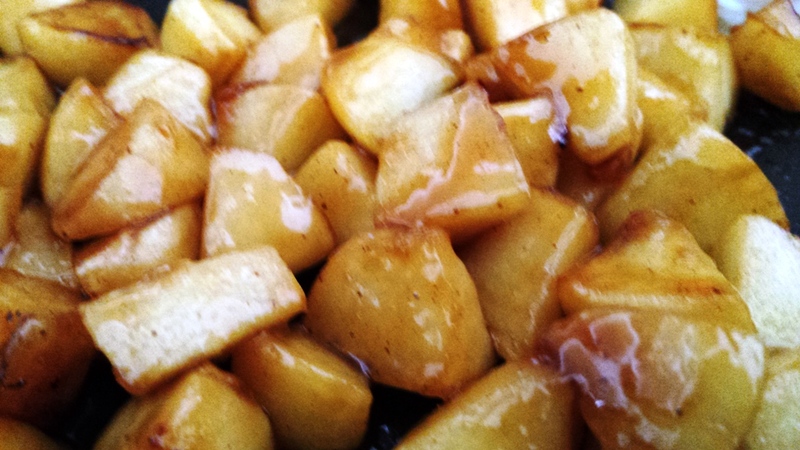 The caramelized cinnamon flavoured apples, sweet and satisfying. To top it all up a dollop of melting caramel or a scoop or two of ice-cream makes it all even more special. 1. Preheat the oven 180 C (350 F). Line a 20cm – 23cm cake tin with baking parchment and brush with butter. 2. Place 1 Tbs granulated sugar in a shallow frying pan, add the cubed apples pieces to the pan and let them caramelise on a low heat, until light golden brown while moving them around in the pan. Once caramelised remove from the heat, add 1Tbs of the caramel sauce /butter and the cinnamon toss the caramelised apples until well coated, set aside to cool down. 3. Using an electric mixer, mix butter and sugar until creamy. Add the eggs, one at the time, and mix well. 4. Sift the flour and baking powder together. Start by gently folding the sifted flour to the butter and egg mixture alternating with little milk for a smooth consistency. 5. Continue this until you have incorporated all the dry ingredients. Do not overwork the mixture, yet making sure all is well mixed. 6. Spread the cake mix in the buttered baking tin. 7. 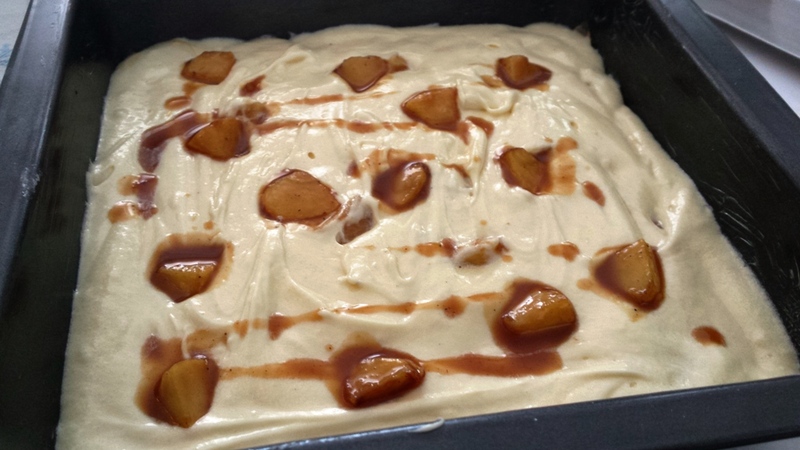 Scatter the cool caramelised apples pieces around in the mixture, tucking them gently into the cake mix. 8. Bake in oven, 180 C (350 F) for 30-45 minutes, But check after 30 minutes to be sure. 9. Ready when a cake tester comes out clean. 10. Serve with more caramel drizzle on top or with a scoop of ice-cream. Brinda’s Note: It’s Gluten free but by all means should you wish to you can always substitute with non-gluten ingredients. 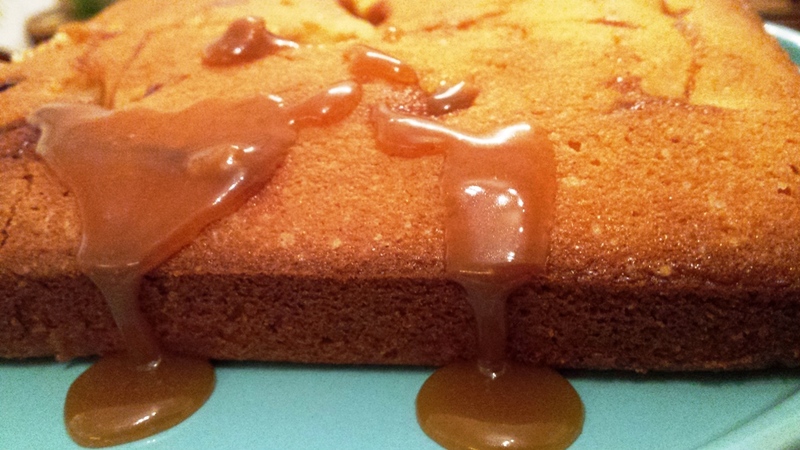 This cake can be made as a tray bake in a square tin.